A new wave of fiction and memoirs by veterans of the wars in Iraq and Afghanistan has started to emerge. Many of these new war writers focus on the psychological disorientation soldiers experience when they return home. National book award-winner, Phil Klay, a former marine, explores the disconnect some soldiers feel with family and friends. Former war correspondent and marine, David Morris, draws on his own experiences to write a cultural and literary history of post-traumatic stress. 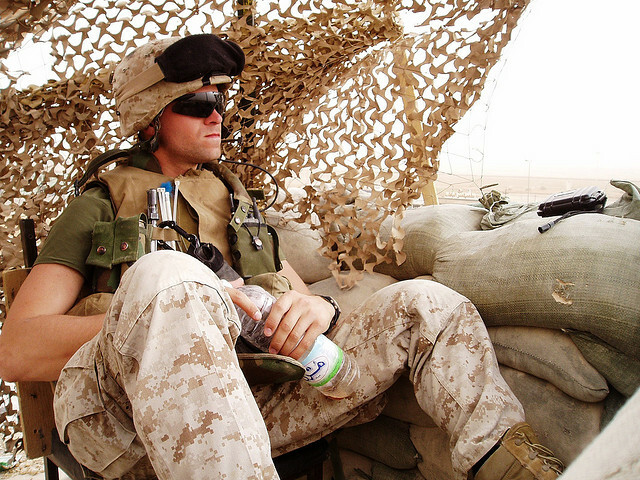 A conversation with two marine veterans on their writing about the trauma of armed conflict. Phil Klay Author and U.S. marine veteran. His collection of short stories, "Redeployment," won the National Book Award in 2014. He returned from Iraq in 2008 after serving in the Anbar Province. David Morris Author and U.S. marine. He is the author of "The Evil Hours: A Biography of Post-Traumatic Stress Disorder." His writing has appeared in The New Yorker and Slate. Excerpted from THE EVIL HOURS: A Biography of Post-Traumatic Stress Disorder by David J. Morris. Copyright © 2015 by David J. Morris. Used by permission of Eamon Dolan Books and Houghton Mifflin Harcourt Publishing Company. All rights reserved. Excerpted from “Redeployment” by Phil Klay. Reprinted by arrangement with Penguin Press, a member of Penguin Group (USA), a Penguin Random House company.